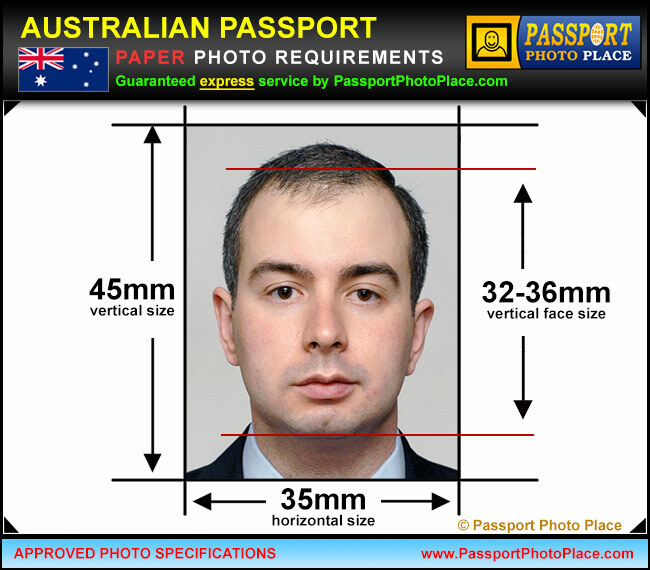 Passport Photo Place specializes in producing Australian passport photographs. We take and digitally print passport pictures per specifications provided by Australian Government Passport Office. The Department of Foreign Affairs and Trade provides highly specific requirements that must be followed in order to properly submit a passport application. Australian Passport Office accepts printed versions of photographs. The Embassy of Australia requires applicants to utilize services of a professional photographer to avoid delays associated with passport applications, which may result in rejections of submitted photographs. Passport Photo Place captures and provides printing of the Australian passport pictures that are 100% compliant with Australian Passport Office requirements. This helps to ensure that passport application process continues without any unexpected delays. Our photo studio is located in Orlando, FL and provides professional Australian passport photo service. Guaranteed Australian passport picture service. No Rejects! Note that embassy of Australia states – “Approximately 90% of the photographs we receive are not acceptable”. At Passport Photo Place, we strictly and carefully follow all current 2019 Embassy of Australia photo requirements for applicants currently residing in the United States. All passport photography is provided by a professional photographer that specializes in legal document photography. We utilize the most updated photo capture and printing technology to reliably deliver the photo quality and photo longevity requirements to ensure that photographs meet and exceed the specifications of Consulate General of Australia. Real photo studio, and local! All Australian passport photos are produced locally and quickly at our studio in Orlando, FL. The pictures are available instantly for pick up. The studio lighting must allow for shadow free lighting on the face and background. Head covering or scarfs should be removed, unless used for religious purposes. Moles, wrinkles and scars must not be removed. Red eye defects cannot be removed by editing. A properly re-taken photo is required in the case of red-eye photo defects. Please wear a solid-colored top/shirt. White or slightly off-white tops are not accepted since the background for Australian passport pictures is white or slightly off-white and there must be a well defined contrast between the subject and the background. Our Orlando, FL Orange County legal photo studio is accessible via major roads and is in relatively close proximity from the following: Aloma, Altamonte Springs FL, Apopka FL, Apopka, Azalea Park, Belle Isle, Bithlo, Buena Ventura Lakes, Cambell, Casselberry, Casselbery, Celebration Florida, Celebration, Christmas FL, Christmas, Chuluota, Clermont, Cloud FL, Cocoa Beach, Cocoa FL, Cocoa, Conway, Davenport, Doctor Phillips, Eatonville, Edgewood, Fairview Shores, Fairvilla, Fern Park, Forest City, Goldenrod, Gotha, Hiawassee, Holden Heights FL, Hunters Creek, Kissimmee, Lake Buena Vista, Lake Butler, Lakeland, Lockhard, Lockhart, Longwood FL, Maitland, Meadow Woods, Merritt Island and Cocoa Beach, Mims, Narcoossee, Oak Ridge FL, Oakland, Ocoee, Orlando FL, Orlando Florida, Orlando International Airport, Orlando, Orlo vista, Orlovista, Oviedo Florida, Oviedo, Paradise Heights FL, Pine Castle, Pine Hills, Port Saint John, Rosemont FL, Sanford, Sky Lake, South Apopka, St. Cloud, Tildenville, Titusville FL, Titusville, Union Park, University Park FL, Windermere FL, Windermere, Winter Garden FL, Winter Park and Winter Springs.